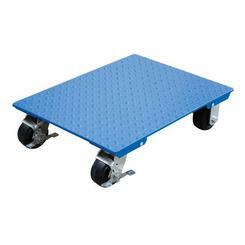 The Vestil PLPS-4840 plastic pallet and skid has combined design elements of both a pallet and a skid, providing 4-way entry for fork trucks (or forklifts), and 2-way entry for pallet trucks (or pallet jacks), and it is made of polyethylene for longer life than most pallet wood, and has a uniform supported capacity of 4,000 pounds. It includes anti-slide grommets to help keep pallets from sliding off forks and each other during transit, and is stackable for efficient storage. Uniform Supported Capacity 4,000 lb. *H is height, the vertical distance from lowest to highest point; W is width, the horizontal distance from left to right; D is depth, the horizontal distance from front to back. A skid is a pallet with no bottom deck, allowing the wheeled forks of a pallet jack to roll underneath the load for transport. Pallets are primarily used for the distribution and storage of individual items (which may be of various sizes) combined into a uniformly sized unit load for efficiency. Plastic pallets typically weigh less than wooden pallets, which can help save on transportation and labor costs when used in bulk. Plastic pallets are often used for export, because they are exempt from International Standards for Phytosanitary Measures No. 15 (ISPM 15) testing, which is intended to reduce the shipping-related spread of disease and insects that could negatively affect plants and ecosystems.